Today we interview Patrik Malmberg, one of the early users of Weld. ﻿Tell us about endoverend and yourself – what do you do? I work as a freelance consultant under the name endoverend AB, in the early-stage product development phase (horizon scanning, ideas, concepts, product definition), facilitating workshops, process improvement and hands-on work, with a focus on the digital transformation. I also develop concepts and projects, on my own or with partners, based either in something I/we need, or an area I find interesting. 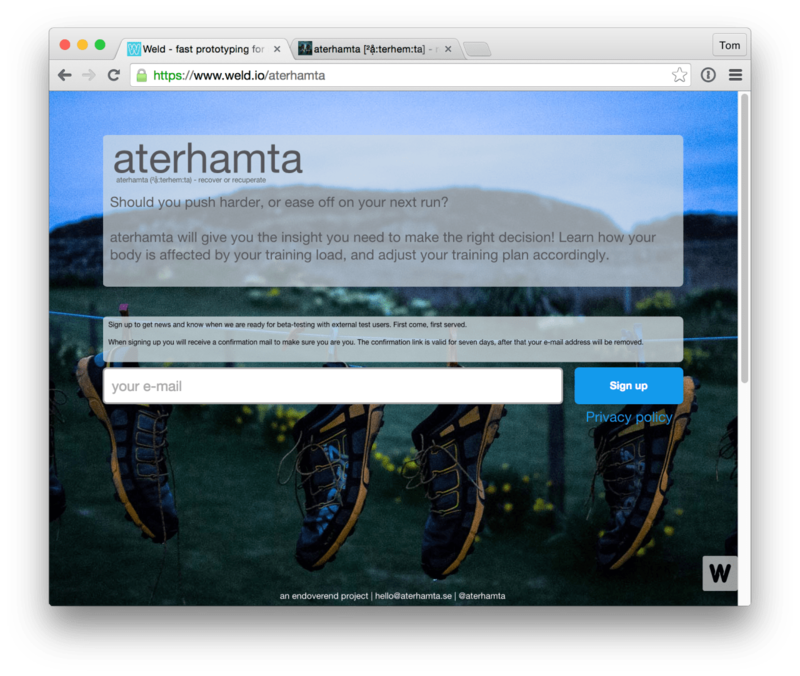 ﻿What is the background of the “aterhamta” project? 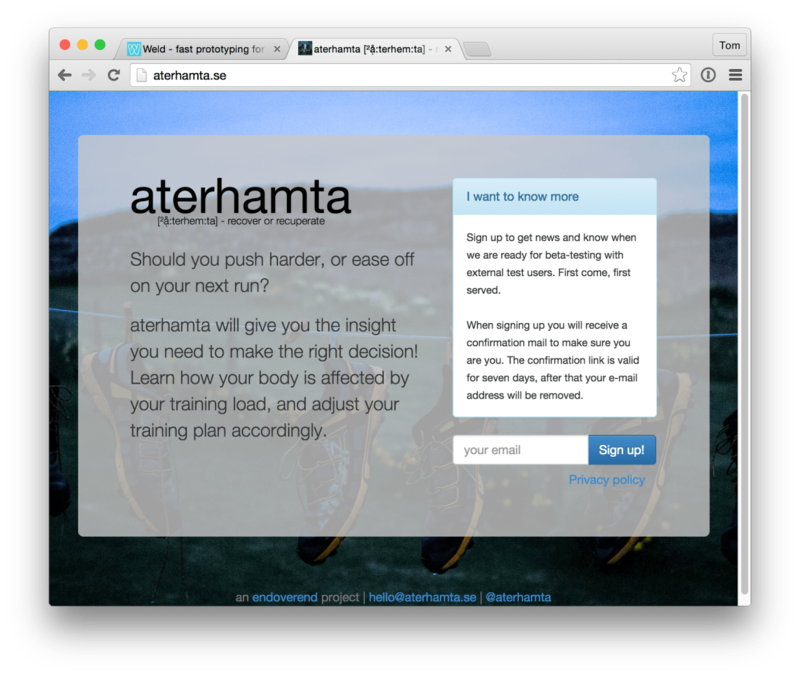 aterhamta (http://aterhamta.se) is one concept that I have taken a little bit further. It is about using digital tools to optimise exercise. It started from a love of running, an interest in digital health, and from my knowledge of medical technology. Many digital fitness/health tools today are very good at collecting data, but maybe not as good at analysis or providing the user with actionable insight. I believe that to compete you either need to be very good on the hardware part and/or very good at the insights/analytics part. I wanted to take a stab at the analytics part. What was it like prototyping the website in ﻿Weld﻿? I always do sketches on paper before going digital, for one screen size only. I liked that transferring the sketches to Weld immediately gave me a view of how they look on other screen sizes. This helped my thinking for those screen sizes. I worked interchangeably between paper and Weld. Depending on “digital” maturity of users/testers, it should be possible to run all of it in Weld. Weld also opens up for working in a virtual team (as you can see updates in real time), which is harder when working with paper prototypes. What ﻿did﻿ you discover/learn during the prototyping phase? I mainly discovered that the tablet format is messy with all different screen sizes and variations, and I really needed to think different for all formats. I also had to cut down on text to avoid a wall-of-text. How﻿ ﻿did the final site turn out, compared to your prototype? Compared to the first prototype it contains far less text, and the text is written inside the grey panels instead of directly on the background image. I also re-did the tablet version on the launched site. I had more interaction in the beginning, but took it out.